For all your Bill Bateman needs, look no further than The Doghouse Lords, with dates next week in California. As an added bonus, it looks like Bateman and John Bazz are pulling double duty with The Blasters on a couple of these gigs. Doghouse Lords guitarist Chopper Franklin (late of The Cramps) tells nofightin.com that tour dates and more can be found on the mutts’ new site doghouselords.com. Aug. 5: Redwood Bar, L.A.
Aug. 9: Redwood Bar — the “Doghouse Duo” in L.A. If anyone hits these shows, give us your review on nofightin.com. 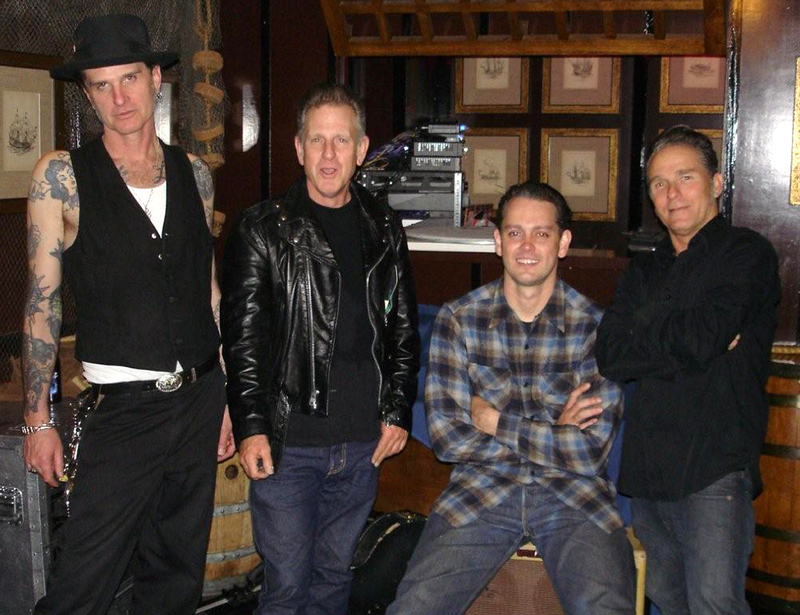 In the Fall of 2008, Javier “Jake” Matos (Blue Shadows), Scott “Chopper” Franklin (Cramps, Charley Horse), Bill “Buster” Bateman (Blasters, Red Devils) and John Bazz (Blasters) came together to record “Diggin’ at the Doghouse”. The songs infuse their histories of blues, rock n roll, country and rockabilly to create a unique mixture that makes for fine sippin’ of a Molotov cocktail. And with a band whose members have performed/recorded with Johnny Cash, Bo Diddley, Carl Perkins, the Fabulous Thunderbirds and Willie Dixon, that makes for some good drinkin’. This entry was posted on August 1, 2009 at 6:46 pm and is filed under bill bateman, related music with tags bill bateman, blasters, blue shadows, blues, california, chopper franklin, cramps, doghouse lords, javier matos, john bazz, rockabilly, roots, video. You can follow any responses to this entry through the RSS 2.0 feed. You can leave a response, or trackback from your own site.